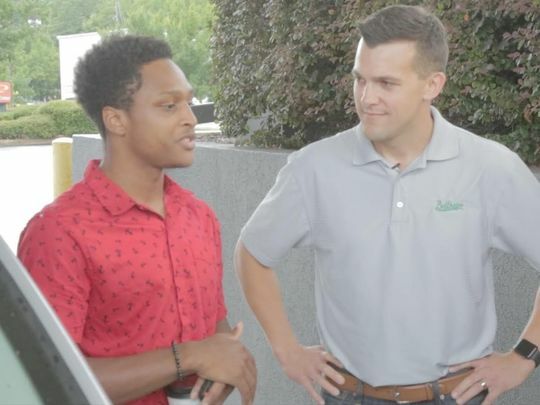 Luke Marklin ’07, who is the CEO of Bellhops Moving, recently made a big splash in the news with this story as reprinted from the Indy Star (7-17-18). When Purdue University graduate Luke Marklin learned that one of his newest employees was willing to walk 20 miles to work on his first day just to prove his dedication, the Boilermaker knew he had to find a big way to thank him. The now-viral story of Walter Carr, a 20-year-old college student from Alabama, began Friday. That was the day his 2003 Nissan Altima broke down, and the day before he started work as a mover at Bellhops moving company. He made it about 14 miles when police officers stopped him on the side of the road around 4 a.m. After hearing his story, the officers took him to breakfast at Whataburger, drove him to a church to rest and said they would send someone to check on him. A short time later, another police officer pulled up and gave Carr a ride to the home of Jenny Hayden Lamey, who Carr was scheduled to help move that day. Luke Marklin is a 2007 graduate of Purdue’s Construction Engineering and Management program. After earning his bachelor’s degree, he worked as a project manager for Barton Malow, a commercial construction company. Wanting to round out his engineering background with a set of strategic and financial tools, Luke left Barton Malow to attend Harvard Business School. After earning his MBA, Luke worked as a corporate strategic planner for Emerson before moving to Uber as the General Manager of the Southeast markets. He became the CEO of Bellhops in 2017 as the company transitioned out of its startup phase. USA Today contributed to this story. Call IndyStar reporter Justin L. Mack at 317-444-6138. Follow him on Twitter: @justinlmack. © Copyright 2019 Sigma Chi Fraternity. All Rights Reserved. This badge requires more of me than the world requires of other men. Find out about all the exciting undergrad and alumni events, awards and activities going on at Sigma Chi Fraternity, Purduce University. See News & Events.